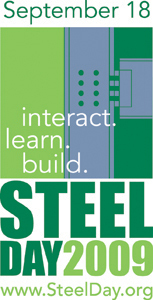 Design Data will open its doors to the AEC community and local students as part of SteelDay 2009, sponsored by the American Institute of Steel Construction (AISC). The first-ever SteelDay will be held on Friday, September 18th, at numerous locations across the United States, and right here in Lincoln, Nebraska. SteelDay 2009 at Design Data will kick off with lunch at noon, followed by two one-hour sessions: one specifically geared toward engineers and architects, and one for educational institutions and students. Learn more about the current state of Building Information Modeling (BIM) from experts at Design Data. As an industry leader, Design Data facilitated the first file transfers that were predecessors of BIM in construction. We'll give you ideas on how to streamline your BIM process and get the most out of your software. If you have questions about BIM, this is a great time to get some answers. Between sessions, take time for a building tour, network with your peers, and meet local students interested in entering our industry. Many high schools, colleges and universities now use the SDS/2 system as part of their curriculum. With hands-on SDS/2 experience, students graduate with an edge in the competitive structural steel detailing and engineering market. Hear first hand from students, instructors, and industry users who have been impacted by the Design Data in Education (DD in EDU) program, and learn how your school and students can receive SDS/2 for free.